Still waiting on official word from SAA, but according to Kate, our roundtable is approved! Go us! Until we get web space from SAA, we’ll continue to use this blog to keep you informed about what’s next for the group. Stay tuned, and feel free to start sharing ideas in the comments or by email. UPDATE: Re-submitted! No more editing needed. Thanks for all your help. SAA just informed me that our petition needs to be in this format (Word doc). And the deadline is tomorrow. The original petition is here (pdf), and the draft I’m working on right now is here (Google Doc). Please help if you can! Our proposal is now a Google Doc that you can read and comment on! If you want editing privileges, comment here with the email address field filled out (it won’t be visible except to the blog admins) or follow the instructions in the Google Doc. Plenty of room to add more stuff, and please add anything you think is even remotely relevant–the proposal team will edit everything before we send it in. Our goal is to submit the finished petition to SAA on Tuesday and start collecting signatures on Wednesday. To sign the petition, all you have to do is send an email to SAA (and be an SAA member). We’ll have instructions up next week for how to do that. ETA 12/20: The petition will close for editing TONIGHT at 8 PM. Remote participation: can we do it? 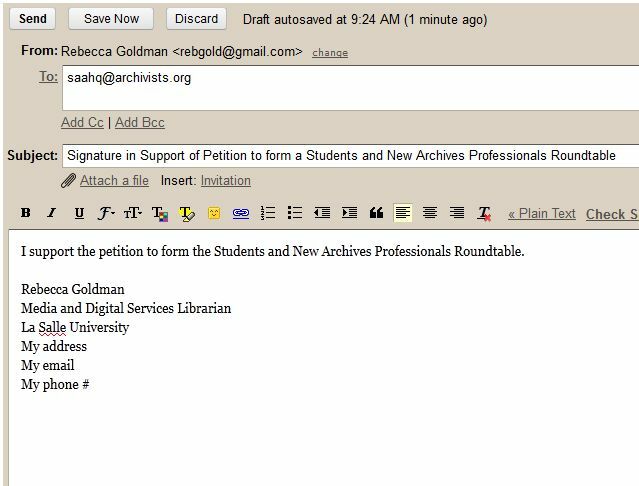 How can archivists who can’t attend SAA participate in our RT meeting? Is providing a summary of the meeting after the fact good enough? Any other issues related to remote participation?